Some time ago, I came across some interesting statistics from Hubspot that got me thinking about how high value guest blogging factors into my business’s content marketing strategy. The post is almost two years old, and a lot has changed since then. So I was curious to know – do Hubspot’s statistics still ring true? Is blogging still an effective strategy to drive traffic to your business? In my case, turns out it still is. But as I always say, don’t just take my word for it. Follow me on a trip down the Google Analytics memory lane (and pick up lessons for your own strategy) as I show you how targeted, high value guest blog posting (on my own blog and on other blogs) drove massive traffic to my business. A few years ago, then-Google Head of Webspam Matt Cutts said guest blogging is dead, the digital marketing world – particularly content marketers, were thrown into a state of uproar. “Stick a fork in it,” Cutts said. Guest blogging has gotten too spammy, and It. Is. Done. But thankfully, we don’t take everything Google’s PR machine spits out for fact, we look at real data! Fast forward to 2017, and I wanted to take a look back at my own guest blogging efforts to see if guest posting has been, indeed, rendered useless. So I went over to check Google Analytics for my business site, NinjaOutreach.com, and I was pleasantly surprised to see evidence to the contrary. Here was my process, and you can do the same for your website if you’ve been guest blogging frequently. First, go into your Google Analytics. Set the calendar on the upper right corner to cover the period you would like to check. In my case, I set the period to cover January 1, 2015 to January 25, 2017. This gives me an overview of how our website has evolved since then. Next, head over to Acquisition > All Traffic > Channels on the left-hand menu. You’ll see your total sessions for the period entered. For NinjaOutreach, our total was close to 500k sessions. 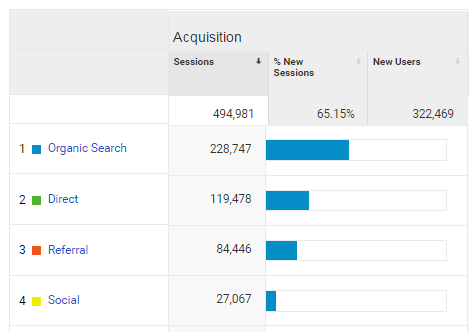 Of this, referral sources came up third and made up around 84k, or 17.06% of total sessions, with Organic Search and Direct Traffic making up the bulk. Focus on Referral traffic, since this statistic reports site visits that came from an external source – such as a guest blog post. This shows you which sources referred traffic to your site. Lengthen your list a bit to show 50 rows. Now I can see all the important referral sources. Of the 50 top referral sources for my business page for the whole two-year period, nine of those came from sites I had guest blogged for. In total, those sites drove 5.47% of the entire two years’ worth of referral traffic – ranking guest blogging as third among referral traffic strategies. Actually, it’s better than not bad, it’s really pretty good. Let me reiterate – 10 posts that I wrote contributed to over 5% of all of the referral traffic that my business received over the course of two years. From a value perspective i.e. what that traffic is worth, it’s a very good ROI for a finite time investment for all the inbound links. So from my perspective, I can say guest blogging is definitely not dead. And what lessons can we learn from this trip down memory lane? 1. All the guest blogs that drove the most amount of traffic to my business page are high quality and relevant to my niche. I only reached out to blog owners that met my criteria before I became a guest blogger for the site. 2. These sites that I got inbound links from are all authoritative in the niche, meaning they have good domain authority and lots of good content. 3. My guest posts provide value to the blog audience readers, and link out to other authoritative sites (not just linking to my site). Don’t just get a link in the author bio, get a link in the actual content. Final takeaway: Write killer content. In short, my strategy was to target quality blog sites, and produce high value blog posts with the end target in mind: a real, thinking, working, paying human. 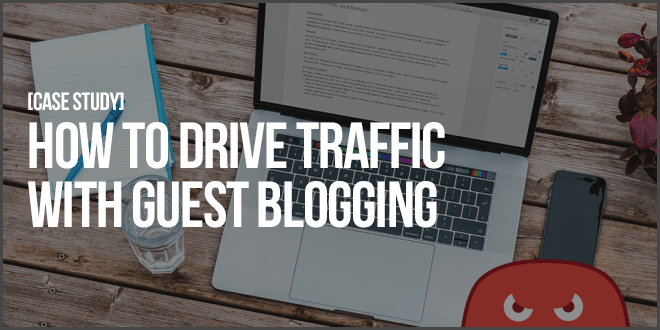 Editors Note: If you want help executing a guest blogging strategy like above, check out our guest blogging service! Now let’s look at our own in-house blogging efforts, where, to be clear, the majority of the benefit was derived. Go to Behavior > All Pages in Google Analytics. Again, I clicked 50 rows, and the data below showed me the top performing pages on the site. 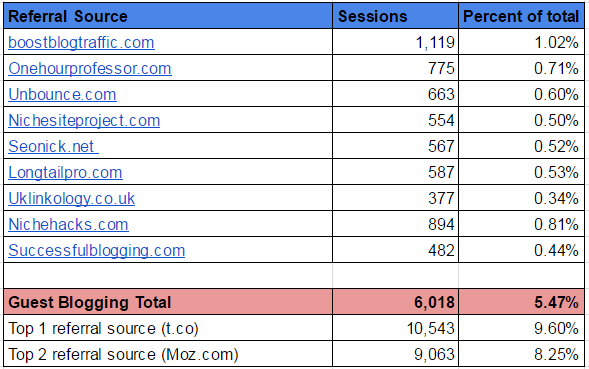 The results painted a fantastic picture about the value of our in-house blogging. The number of pageviews and unique pageviews indicated that many people found our blog posts valuable. 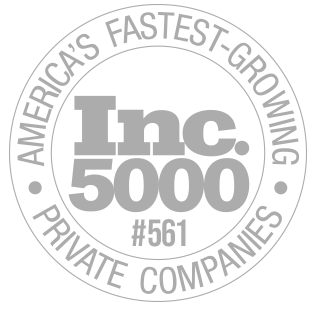 Our top post, 500 Ways to Make Money Online, which is a comprehensive list post that I wrote, has almost 30k unique pageviews. Another post, which is my in-depth review of Rami Sethi’s earn 1k course, showed readers’ average time on page went for as long as seven minutes! These were posts published way back 2014, but are still among our top performers through 2017. Overall, our blog has accounted for ~50% of the traffic that the website has received. A quick look at our WordPress showed that as early as 2015, we didn’t have a regular blog posting thing going on yet. Frequency of blog posts would go from 11 times a month, to five, and sometimes up to 23. We only stabilized frequency around 2016, when we would consistently post between 13 to 15 posts per month, usually between Tuesday and Friday. From what I’ve seen overall, when it comes to publishing our own blog posts, quality and consistency were the most important factors. We didn’t publish every day. In fact, for the whole month of November 2015, we only published four posts. Of those four posts, the collection of digital marketing case studies that I published November 19 of that year is actually still one of our top performing blog posts. It’s got almost 12k unique pageviews, making it our third most viewed blog post to date. Both guest blogging and blogging on your own site works together. It’s much easier to get a natural in-content link to a value-driven blog post. The stats don’t lie – here’s what we now know years later. One. Targeted guest blogging (guest posting) WORKS. Armed with just a handful of killer guest posts, if you target quality sites – blogs that have a good authority and are niche relevant, (hence a high trust rating), you can get a very nice amount of traffic. Two. Blogging on your own website WORKS. Quality is the most important factor, but you need to also commit to content. Publish high value, well-researched posts, focus on promoting it well on social media, and you’ll get the eyeballs and trust of your audience. Now, if you’re worried about how you’re going to affordably and efficiently produce all of this quality content, allow me to recommend the Hoth’s Blog Writing Service, which will take care of all of this for you, so you can sit back and let the results pour in. ← March Sale On High DA Private Vault Links! The Hoth just gets better and better and better still..
absolutely amazing and quite impressive. Speaking as something of an ‘old school’ SEO guy, I believe strongly in the benefits of blogging and striving for genuine quality writing, it can’t be beaten for gaining profile out there on the global environment. I have seen some of my articles quietly get to significant placings on a world-wide basis which results in relevant traffic. SEO is not about physics or hard science it is about connecting with people and providing value-this what traffic actually is. To be fair, Cutts did try to distinguish between low-quality paid-link guest posting and quality, genuine guest posts. He just wasn’t clear because his focus was always on the spam. Plus, he’d been wound up by an email offering *him* (of all people) paid-link guest-blogging. He was partly conflating email spam with search spam. Trouble is, it’s hard to identify spammy guest blogging algorithmically. Spun content is often obvious, but how is a guest post different from a new staff-member posting, *content-wise*? It isn’t – the distinction is an offline one. Nor do new staff members always write well. Should Google treat their content as spam? Of course not. Weak content, maybe, but not spam. So what do you do, as Google? You blog that spammy guest blogs are bad and do what you can to block the most obvious stuff. That at least raises the bar a bit. Then, when the manual team spots clear violations, they can respond aggressively and say “We warned you”. Is it a surprise, then, that quality guest-blogging still works? No. It’s a useful reassurance, though. Another great case for collecting data and seeing through the ‘noise’. In my own experience tracking each article has been critical, almost as much as producing the content in the first place. Data is everything. Thanks for the reminder. Awesome to see real world vindication of this strategy – I recently took a look at Backlinko.com’s monthly traffic stats in SEMRush and the results really speak for themselves. Brian Dean blogs seriously high quality content and generates about 32k visits per month, total monthly traffic value of $162k…as far as I can see that’s all from blogging – shares, links etc, no paid ads. That figure blew me away and really shows the continuing value of blogging. I also continued to recommend guest blogging, even after Cutts pronounced it dead. Because the thing is, writing good content and sharing it on sites that your target audience visit is simply good marketing. And that’s not going to hurt your SEO. 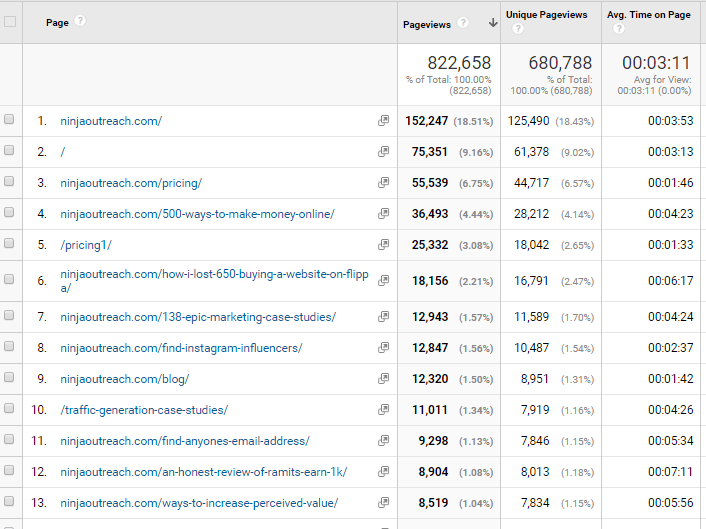 It is amazing that 10 posts written accounted fo 5% of your traffic. IMHO that alone shows the power of QUALITY guest posting on QUALITY sites. Continue the great work on your blog, even as veteran of 20 years I always learn something new from each post. Just wish I could write as well we you! The same reason why quality guest posting can drive traffic for SEO is the same reason why affiliate marketing pros can make authority sites on multiple topics but under one main niche and dominate within it. Those articles are already on sites of authority and if the content is engaging enough, people will like, share, ect. Having all these things happen from multiple sources at once will affect the page it eventually links towards. This was absolutely a great post about guest blogging. Great tips here. Thanks for sharing. With guest posting you can link back to your main site. That way you get links, and referral traffic.